Our Van Nuys gate repair techs have advanced levels of training in repairing and maintaining all types of gates. If your gate is stuck, or your electric gate won’t open, our specialists can quickly diagnose the problem and fix it in no time! What are the Best Gate Repair Companies in Van Nuys? Property owners have several choices when it comes to Van Nuys gate repair companies; some are good, others have a ways to go. Everest Garage Doors and Gates stands out in a class of its own because we offer a business model and level of service nobody else nobody else is willing to perform. We offer a class of customer service that is intimately personal, because we care about our community members. Then we add skilled Van Nuys gate repair specialists hand-picked from a pool of Los Angeles gate repair experts to ensure all work is done to the highest standards. Everest offers all the major services anyone could possibly need, and we arrive to properties with lightening speed. Finally, no other gate repair company in Van Nuys offers a price as low as ours for such high quality work. We are dedicated to pleasing every customer, no matter what. Depending on how “handy” you are, and what type of gate you have and how bad the sagging is, these kits don’t always work and more often than not property owners with good intentions wind up causing further damage to their gate. Our Van Nuys gate repair service correct sagging gates all the time, as this is a very common issue. When we fix a sagging gate we are able to diagnose the cause and educate homeowners on how they can prevent it from happening again. If the gate is just poor quality, our gate repair specialists will advice the homeowner, and if a new gate is required we have access to hundreds of models, as well as our affordable custom gates. What Should I do When my Gate Won’t Open and Close? If none of these pan out, call our team of Van Nuys gate repair pros so we can diagnose the problem, fix it, and test every component of your driveway gate to ensure it is in perfect working order. If you want to explore your options on a Van Nuys custom gate for your home, give our Everest crew a call and once we learn more about your property and your uniqie tastes, we can put together a proposal that will wow you! Are Custom Gates Worth Buying? Everest can make a sleek modern metal gate, a ranch style rustic gate, or a Victorian-inspired gothic wrought iron electric gate. We can make wooden and metal custom gates, use both materials, and even do ornamentation and decorative work using brass, copper, tin, steel, iron, or any metal. We also source all types of wood ranging from pine to oak, black walnut, bamboo, birch, and everything in between. Want to include elements of mosaic tiles or stained glass into your Van Nuys custom gate? No problem; our artists can create a gate based on any vision or design wishes. Give us a call, and discover how we can add a touch of class and elegance to your home or business. We aren’t afraid to sing our own praises, but more importantly neither are our customers. 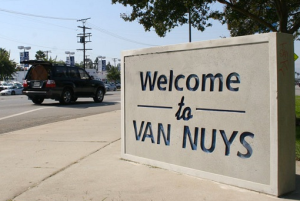 We are the best Van Nuys gate repair company because we raised the bar in customer care for other companies in this industry. Each customer becomes a member of our family, and we work with passion to secure every single property in Van Nuys using the most highly trained technicians. Our work is flawless, affordable, and we offer a plethora of options that include gate sales, custom gates, gate opener repair, gate opener sales, and routine maintenance. We do our research to stay ahead of the curve because we want to know without a doubt that our customers get the best service in Van Nuys gate repair when it comes to pricing, quality, and customer care. Call Everest today, and let us give you a class of service unlike anything you have experienced.